From Goodreads: "Let me make it in time. Let me meet Shadow. The guy who paints in the dark. Paints birds trapped on brick walls and people lost in ghost forests. Paints guys with grass growing from their hearts and girls with buzzing lawn mowers." I requested this book on NetGalley and was super excited when I got an email saying that my request had been approved! Since I'm an Aussie and this is an Aussie book I was pretty excited! Set in suburban Melbourne this book follows the story of Lucy and Shadow. Shadow is a graffiti artist who has sprayed pieces all over the town. His pieces are accompanied by poetry by his friend Poet. their true identities has been kept hidden to ensure they don't get caught by the cops. From the start we as the reader know their identities. Shadow is known as Ed and Poet is Leo. When we are first introduced to Ed he seems arrogant, but that could possibly be because he is re-meeting Lucy after dropping out of school not long after she broke his nose. Ed has always been able to express himself through art. Studying art in school he was expected to learn the history of certain artist. He finds himself being judged for not being book smart when he knows just as much about art as the next student, he has just learnt it in a less conventional way. Leo's chapters were significantly different to Ed's and Lucy's. His were made up of poetry. From his poetry you can see how much he grows and changes as a character throughout the book. I have to say that I pretty much skimmed over these chapters though. I'm not big on poetry, and got so caught up in Ed and Lucy that I just wanted to know what happened with them next. Lucy has seen and loved all of Shadow's pieces. She understands his work in a way that other people don't. She wants to meet the famous Shadow, believing that a boy who can create such works of art would be different to all the jerks out there. Lucy is a great character. She doesn't take any nonsense from anyone. She is smart, book smart and loves art. Spending most of her time in a glass blowing shop. She wants to meet Shadow, thinking that he will have the same appreciation for art as she does, and she isn't wrong. Getting forced in to a spending a night together Lucy and Ed finds themselves in search of Shadow. What Lucy doesn't know is that Shadow is Ed and he is taking her on a wild goose chase! As the story goes on Ed realises that Lucy doesn't want to meet Shadow for the sake of meeting him, she thinks that he really does have a talent and that he could be worth all of her chasing. What he doesn't count on is Lucy and Ed hitting it off so well. Especially after the nose breaking incident. Lucy starts to think that she doesn't want Shadow, she likes Ed more than someone she may have no chance of meeting. Lucy and Ed are both very likeable characters once you get to know them. I really felt that they grew as characters as the story went on and their relationship grew. 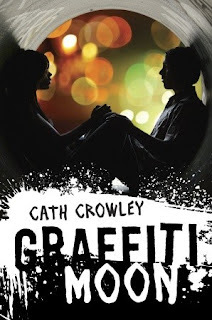 This book was beautifully written, the descriptions of Shadow's graffiti pieces were very well done, I can picture them in my mind. Graffiti Moon was an easy and fun Aussie read that covered some deeper problems of society. I look forward to checking out more work by Cath Crowley! Have you read any Aussie YA that you can suggest for me?